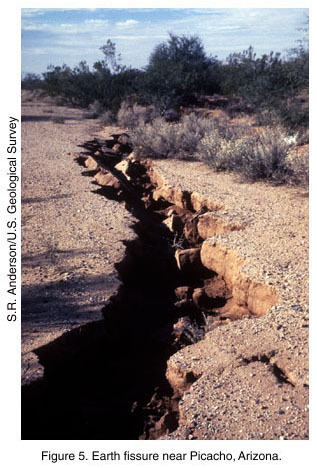 Land subsidence is the lowering of the land-surface elevation from changes that take place underground. Common causes of land subsidence from human activity are pumping water, oil, and gas from underground reservoirs; dissolution of limestone aquifers (sinkholes); collapse of underground mines; drainage of organic soils; and initial wetting of dry soils (hydrocompaction). 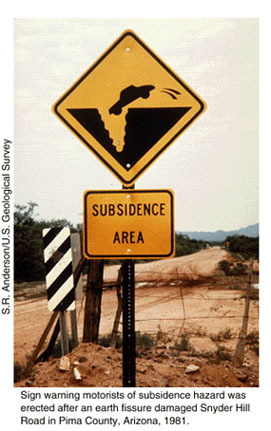 Land subsidence occurs in nearly every state of the United States (figure 1). Figure 1. Click on image to view full size. 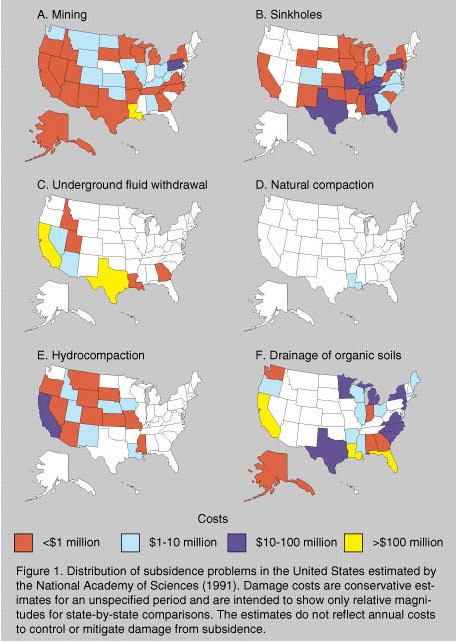 Overdrafting of aquifers is the major cause of subsidence in the southwestern United States, and as ground-water pumping increases, land subsidence also will increase. In many aquifers, ground water is pumped from pore spaces between grains of sand and gravel. 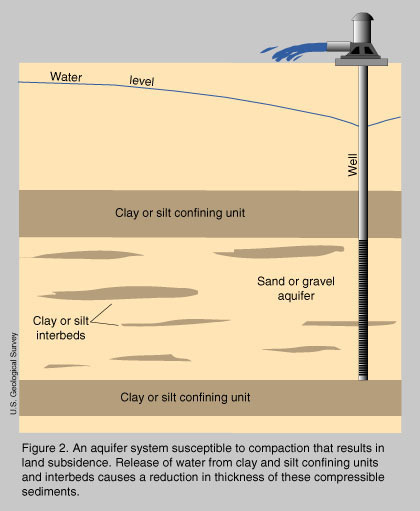 If an aquifer has beds of clay or silt within or next to it (figure 2), the lowered water pressure in the sand and gravel causes slow drainage of water from the clay and silt beds. The reduced water pressure is a loss of support for the clay and silt beds. Because these beds are compressible, they compact (become thinner), and the effects are seen as a lowering of the land surface. The lowering of land surface elevation from this process is permanent. For example, if lowered ground-water levels caused land subsidence, recharging the aquifer until ground water returned to the original levels would not result in an appreciable recovery of the land-surface elevation. Land subsidence causes many problems including: (1) changes in elevation and slope of streams, canals, and drains; (2) damage to bridges, roads, railroads, storm drains, sanitary sewers, canals, and levees; (3) damage to private and public buildings; and (4) failure of well casings from forces generated by compaction of fine-grained materials in aquifer systems. In some coastal areas, subsidence has resulted in tides moving into low-lying areas that were previously above high-tide levels. 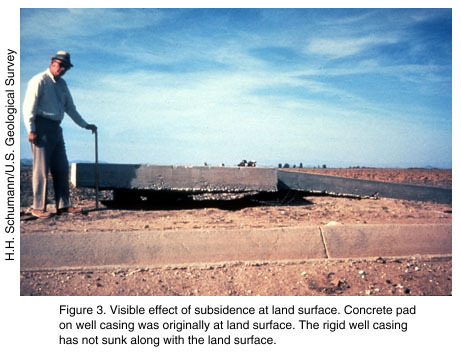 An example of damage caused by land subsidence can be seen in figure 3. 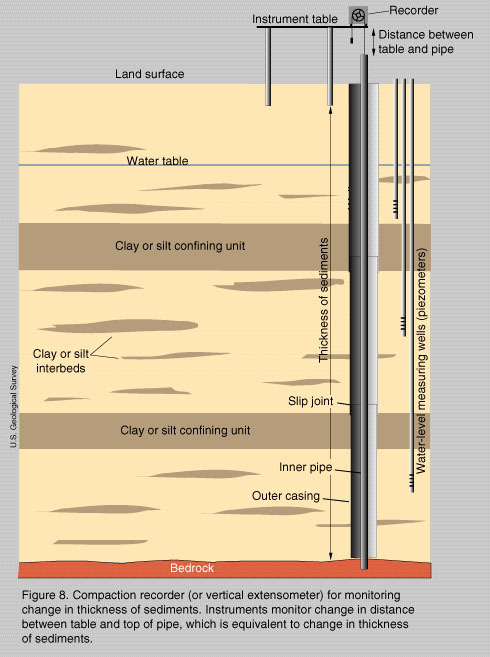 The concrete base at the top of the well is above ground level because the land surface has lowered and the rigid well casing has not sunk. Figure 2. Click on Image to view full size. Figure 3. Click on Image for full size with explanation. 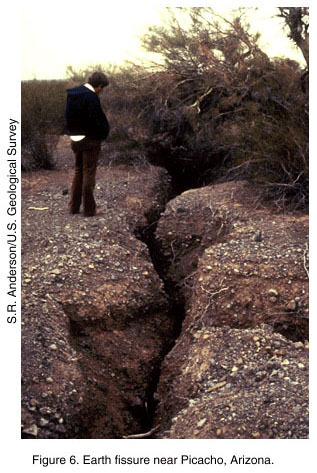 In many areas of the arid Southwest, earth fissures are associated with land subsidence. 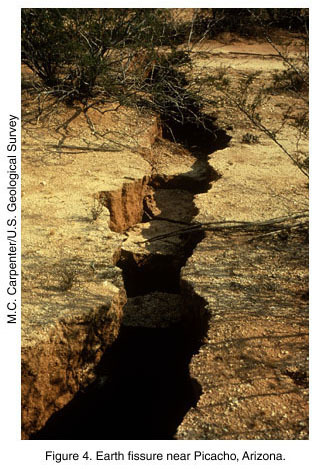 Earth fissures can be more than 100 feet deep and several hundred feet in length. One extraordinary fissure in central Arizona is 10 miles long. These features start out as narrow cracks, an inch or less in width. They intercept surface drainage and can erode to widths of tens of feet at the surface. Examples of earth cracks are shown in figures 4, 5, 6, and 7. Earth fissures are caused by horizontal movement of sediments that occurs when ground-water is pumped. Figure 4. Click for full size and explanation. Figure 5. Click for full size and explanation. Figure 6. Click for full size and explanation. Figure 7. Click for full size and explanation. In areas where climate change results in less precipitation and reduced surface-water supplies, communities will pump more ground water. In the southern part of the United States from states on the Gulf Coast and westward including states of New Mexico, Colorado, Arizona, Utah, Nevada and California, major aquifers include compressible clay and silt that can compact when ground-water is pumped. Also, increased population in the Southwest will increase demands on ground-water supplies, causing more land subsidence in areas already subsiding and new subsidence in areas where subsidence has not yet occurred. In the past, major subsidence areas have been in agricultural settings where ground-water has been pumped for irrigation. In the future, however, increasing population may result in subsidence problems in metropolitan areas where damage from subsidence will be great. 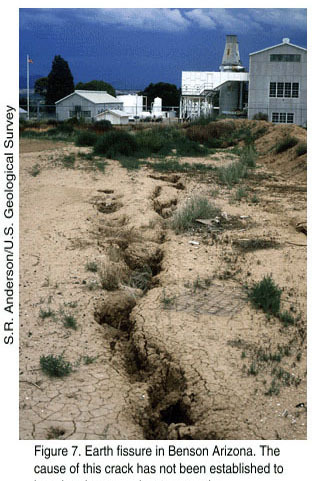 Several methods are available to monitor land subsidence. The most basic approaches use repeated surveys with conventional or GPS leveling. Another approach is to use permanent compaction recorders, or vertical extensometers (figure 8). These devices use a pipe or a cable inside a well casing. The pipe inside the casing extends from land surface to some depth through compressible sediments. A table at land surface holds instruments that monitor change in distance between the top of the pipe and the table. If the inner pipe and casing go through the entire thickness of compressible sediments, then the device measures actual land subsidence. If both ground-water levels and compaction of sediments are measured, then the data can be analyzed to determine properties that can be used to predict future subsidence. About 19 of these installations are operated in Southern Arizona and additional stations are operated in California, Nevada, New Mexico, and Texas. Another subsidence monitoring method under development and testing uses Interferometric Synthetic Aperture Radar (INSAR). With this method, individual radar images from satellites are compared and interferograms are produced. Under the best conditions, land-surface elevation changes on the order of 1 inch or less can be determined. In some areas where ground-water pumping has caused subsidence, the subsidence has been stopped by switching from ground-water to surface-water supplies. If surface water is not available, then other means must be taken to reduce subsidence. Possible measures include reducing water use and determining locations for pumping and artificial recharge that will minimize subsidence. Optimization models coupled with ground-water flow models can be used to develop such strategies.